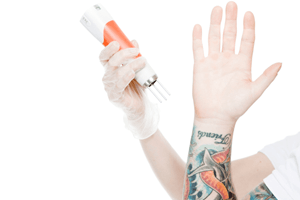 BlogHome » Should I Get A Cover Up Or Laser Tattoo Removal? At Think Again Laser Clinic Sydney, we are regularly asked whether an unwanted tattoo is better off with a cover up, OR should it be treated for tattoo removal/lightening first? 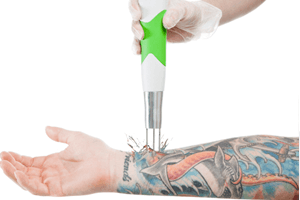 All persons employed at Think Again Laser Clinic are tattoo enthusiasts who have tattoos and have also undergone laser tattoo removal themselves. There is no better expert opinion when it comes to many of the questions our clients have. An important thing to remember when considering this question is that the only way to accurately cover a tattoo is to go over it with darker piece. In the case of small tattoos, the cover up will be much larger, in the case of large and dark tattoos the cover up will not only be much bigger, but also much darker than the original piece. Unfortunately not all ideas and designs will work, with cover-ups providing challenges and many limitations to recreate an art piece. We hear from people in the tattoo industry that designs are generally compromised due to the lack of available blank space and unwanted ink that needs to be accurately covered. Any portraits or colorful bright designs will almost always be impossible to execute especially when the new tattoo must be heavy in dark ink to provide a solid cover-up. 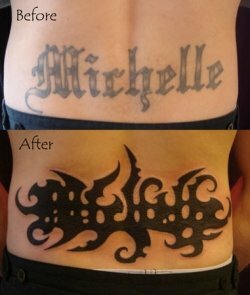 We have friends and clients who have delved into the world of cover-ups prior to receiving any laser tattoo removal, only to be disappointed. We hear they often compromise their original idea purely because it is not possible. We have also seen a handful of ‘successful’ cover-ups which last for only a few weeks until the area is healed and their dreaded original tattoo begins to “shine” through! One of our current clients chose to cover up an Ex partners name, only to have it shine back through once the cover up naturally faded to its current state! You do not need to completely remove a tattoo before you can cover it with a quality piece of art. At Think Again Laser Clinic Sydney, we can treat you as few as 1 or 2 times before providing a variety of options for your tattooist. By lightening to this degree, you are now able to present your tattoo artist with many more options, with far less limitations due to the lighter pigment of the ink. The lighter you get your ink through laser tattoo removal, the more options your artist has when covering up. We are also aware of tattoo artists throughout Sydney who specialise in many differing styles of art; we are happy to refer you on to them after we lighten your tattoo to see what artwork they come up with to suit your individual needs. If you are not happy with the cover up options they give you, then you can have another treatment and head back in to see what new options they can offer. 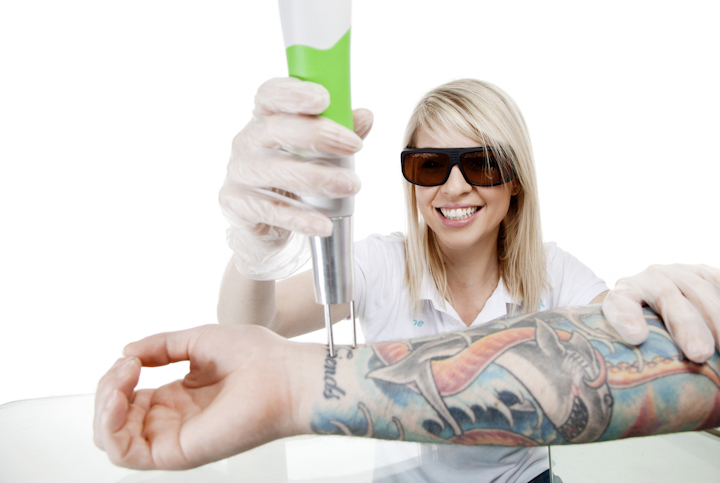 Erasing tattoos requires experts hands on practice with safety measures to avoid any injury. In almost all cases, you are much better off lightening your current tattoo before covering up with new artwork (the exception being very small or very light tattoos). There are exceptional tattoo artists throughout Sydney who can definitely provide you with a new tattoo for you to love, but why limit your choice for design? We have many clients who present with tattoos covered multiple times, fortunately with our leading edge technology we are still able to remove their tattoo, but it does mean that you will require more sessions. Feel free to head to our Facebook, visit www.thinkagainlaserclinic.com.au or contact 1300 166 465 to discuss the options for lightening your tattoo before covering up. 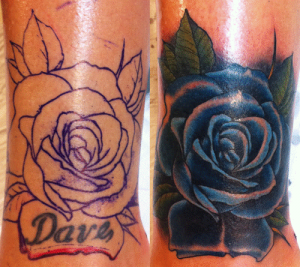 Check out our before and after shots to see just how light we can get your piece in just a couple of sessions. We offer a free consultation process, which is obligation free so if you have been considering a cover up, schedule an appointment today.